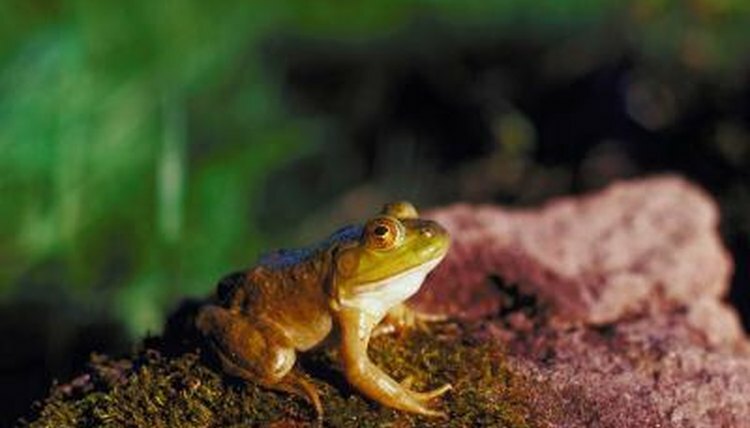 Although frogs are fairly low-maintenance pets, they need a clean environment to remain free of disease. These cute little amphibians shed regularly, secrete mucus through their skin, bathe in their drinking water and eat live food, all of which contribute to waste buildup in their tank. It's essential to clean your entire frog aquarium periodically, as well as to change the water frequently to prevent fungal and bacterial infections. Once you get used to the process, it won't take much time at all. Prepare water ahead of time to add to your clean aquarium. Fill an appropriately sized container with the amount of water you'll need for your specific tank, and then treat the water to remove any chlorine. Leave the water sitting overnight. Remove your frogs and place them in temporary housing if you're doing a complete cleaning. You can buy small plastic tanks for this purpose in most pet stores. If you are just tidying up and changing the water, you can leave your frogs in the tank. Drain 25 to 75 percent of the water from your tank, depending how dirty the water is and how long it's been since you made a partial water change. Use a siphon hose, your filter or a plastic container to remove water. Scoop out most of the gravel or substrate from the bottom of your tank. Unless you are cleaning and sanitizing to treat illness, it's OK to leave some gravel or substrate behind. Place the material into a fine colander, and then use hot water and a scrub brush to clean away any algae or other debris. Rinse well and set aside to air-dry. Look for any uneaten insects or other pieces of food hidden inside your frog aquarium. Remove anything you find. Leaving these inside the tank will promote the growth of bacteria and fungi. Also, look for shed skin that may be left behind after your frogs' shedding cycle. Remove and scrub any plastic plants or other decorative items. Rinse well and return to the tank. Wipe down the inside and outside of the aquarium with paper towels. Do not clean the tank walls with any chemical cleaners. Replace the gravel or substrate slowly and carefully. Add new water to the tank to replace the water you removed. If your frogs are aquatic, refill the tank. If they are semiaquatic or terrestrial, replace water removed from swimming areas. Return your frogs to their clean home if they were placed into temporary housing. Give them time to adjust and calm down before disturbing them again. ⚠ If your frogs are sick or if there's some other reason your tank needs a complete cleaning, it is best to remove your frogs, disassemble your tank, clean everything with mild soap and hot water, replace the substrate and water, and then reassemble your tank. Return your frogs to the tank only after everything is completely clean and reassembled. ⚠ For regular maintenance, don't use soap on anything that will come in contact with your frogs—just hot water and whatever scrubbing is necessary.